CONVERSABLE ECONOMIST: Germany's Prosperity: How Stable are the Foundations? Germany's Prosperity: How Stable are the Foundations? "Germany’s economic performance is impressive, supported by prudent economic management and past structural reforms. Growth is robust. The unemployment rate has fallen to levels not seen in decades and employment is rising. Household and corporate balance sheets are strong and the public debt ratio is declining rapidly. Inflation remains low but wage growth is picking up, reflecting the strength of the labor market." For a more detailed overview from the IMF, see "Germany : 2017 Article IV Consultation-Press Release; Staff Report; and Statement by the Executive Director for Germany (July 7, 2017). Sure, the IMF expresses concerns about how Germany's economy will adapt to an aging population, how it can encourage greater business investment and reduce its gargantuan trade surpluses over time. But these problems, like most economic problems, are a lot easier to address in the context of an economy with solid growth, low unemployment, and declining debt levels. So what are the roots of Germany's strong economic performance? Are there some lessons for other countries? Are there reasons for concern? Dalia Marin has edited a useful e-book, Explaining Germany’s Exceptional Recovery with a group of 10 readable essays looking at various aspects of German economic experience (May 2018, published by the Centre for Economic Policy Research, available from the Vox.eu website with free registration). 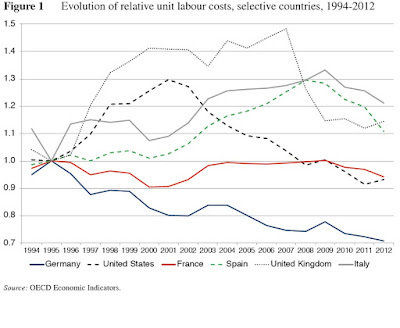 Christian Dustmann, Bernd Fitzenberger, Uta Schoenberg, and Alexandra Spitz-Oener argue that the transformation of the German economy was due to an unprecedented process of decentralisation of wage bargaining to the firm level that led to a dramatic decline in unit labour costs, and ultimately to an increase in competitiveness of the German economy. Wage decentralisation was made possible, they claim, by the specific governance structure and autonomy of the German labour market, not rooted in legislation but laid out in contracts and mutual agreements between employer associations, work councils, and trade unions. This decentralisation of the wage-setting process was driven by a sharp decline in the share of workers covered by union agreements and an increase in opening clauses that strengthened the role of firm-based work councils in wage determination relative to trade unions. The decline in union coverage and the increase in opening clauses, in turn, were both triggered by a more competitive global environment. In particular, the new opportunities to move production to the emerging market economies of Eastern Europe changed the power equilibrium between trade unions and employer federations and forced unions and work councils to accept deviations from industry-wide agreements. 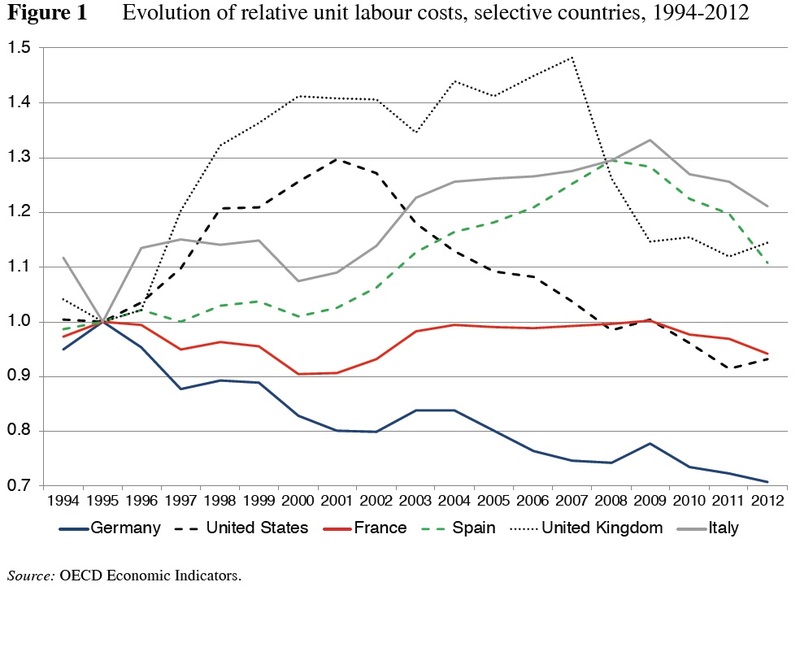 Here's a figure from their paper, showing how "unit" labor costs in Germany have fallen over time, compared to a number of competitors. Other essays explain how this shift in Germany's labor markets, together with the rise of economies in eastern Europe and a trend toward more decentralized German business management, helped the German economy to adapt more readily than many other countries when China entered world markets in force in the early 2000s. Germany has its economic problems, of course. For example, one essay emphasizes that it has historically tended to lag behind in business entrepreneurship and research and development efforts. But when it comes to Germany's economic success, perhaps the single biggest question is how to interpret its very large trade surpluses -- at almost 8% of GDP in 2017, the largest in the world. 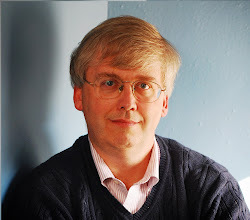 Guntram Wolff focuses in Chapter 6 on the import side of the current account. From a national accounts perspective, a country will face a current account surplus if its savings exceeds its investments. He looks at the difference between savings and investments for the different sectors of the German economy, and finds that the German current account surplus is mainly driven by the corporate sector, where savings have gone up (by around 3 percentage points of GDP), while corporate investment has been falling (by around 2 percentage points of GDP). He dismisses the argument that the ageing of the population has contributed to the current account surplus, as many observers have argued, as the savings of the household sector have not contributed significantly to savings in the economy. His data show that the corporate sector has been deleveraging for more than 15 years, resulting in lower corporate investment in manufacturing in Germany compared to Italy and France. He concludes by advising that the German government should pay attention to Germany’s current account surplus, and suggests that the government should increase public investment (to address the low intangible capital stock that he documents) and encourage private investment. This volume has a lot of useful background, but it also seems to me to sidestep the question of the euro. One reason for Germany's enormous trade surplus is that other nations within the euro-zone have offsetting large trade deficits. In the old pre-euro days, a small or mid-sized European economy with a large and sustained trade deficit with the other European countries would watched or engineered a decline in the foreign exchange rate of its currency, which would have reduced the trade deficit by making the exports from that nation cheaper on world market and making imports more expensive for consumers from that country. Many of Europe’s problems come from the disastrous decision, a generation ago, to adopt a single currency. The creation of the euro led to a temporary wave of euphoria, with vast amounts of money flowing into nations like Spain and Greece; then the bubble burst. And while countries like Iceland that retained their own money were able to quickly regain competitiveness by devaluing their currencies, eurozone nations were forced into a protracted depression, with extremely high unemployment, as they struggled to get their costs down. ... Some of the victims of the euro crisis, like Spain, have finally managed to claw their way back to competitiveness. Others, however, haven’t. Greece remains a disaster area — and Italy, one of the three big economies remaining in the European Union, has now suffered two lost decades: G.D.P. per capita is no higher now than it was in 2000.